During the period of time between 1580 and around 1630, Spain was colonizing and expanding in the Pacific Ocean as were other European countires. In 1602, on Santa Barbara's Day, Sebastian Vizcaino was caught in a storm off shore and was forced to anchor. He named the serene bay Santa Barbara in honor of the saint. In 1760, King Carlos III of Spain became worried that Russia and England might exploit California, so he ordered that four forts be built between San Diego and San Francisco. In August 1769, Captain Gaspar de Portola led an expedition into Santa Barbara to build the first Presidio. When it was finished, the soldier's families established residency nearby which resulted in the settling of Santa Barbara. During your tour of this trail you will visit many of the old adobes of Santa Barbara. Below you will find back ground information and questions which you can answer regarding each site. After your tour you can purchase a patch at the Santa Barbara Scout Office at 4000 Modoc Road. Enjoy yourself on this historical stroll through Santa Barbara! This museum located at 136 De La Guerra Street, is open Tuesday through Saturday from 10-5 and Sunday and Monday from 12-5. This museum is a treasure of historical items, so spend plenty of time looking through it. List five things of interest you saw at the museum. In what year was this adobe built and by whom? In the courtyard of the adobe this is a giant stamp mill. What was this mill used for? At which mine was this giant stamp mill used? De La Guerra Plaza is an historical place in which City Hall, the News-Press Building a few shops are located. When was the first city council meeting held? Casa De La Guerra was built in 1819 by Don Jose de la Guerra. What was De La Guerra's occupation? El Paseo (literally translated means "The Park") was built one century later. El Paseo and Casa De La Guerra now contain many fine shops. When were El Paseo and Casa De La Guerra presented to the Santa Barbara Trust for Historical Preservation? The Orena Adobe, located at 39 East De La Guerra St.reet was built by Don Jose de la Guerra. During what year was it constructed? What was the adobe originally used for? Since Yankee-born citizens in town were receiving threats from the Mexican patriots, the nervous Americans asked for military guard. Colonel John Fremont left a platoon of ten cavalry men to protect the Americans. The platoon used this adobe as their headquarters and guardhouse. On what date did Fremont and a company of U.S. cavalry capture Santa Barbara? This building may not look like an adobe but the wooden siding was put on to protect the adobe from the elements. In 1856, who bought the land upon which the adobe now stands? What was the purchase price for the land? Where did the bricks and tiles used to build this adobe come from? In the 1760's, King Carlos III of Spain became concerned that rival powers of Russian and England might try to colonize "Alta California", the area now known as the state of California. King Carlos ordered that four military fortresses be built to protect the missions and settlers from attack. Founded in 1782, who established the presidio? Why was the Presidio built? List three things of interest you saw athe Presidio Archaeological Site. El Cuartel was built by the Spanish in 1788, and is the second oldest surviving building in California. Its walls are two fee thick. The building was long used as the headquarters of the Mission (now Los Padres) Council, Boy Scouts of America. What did El Cuartel originally house? This adobe was built by Daniel Hill of Boston, Massachusetts. In 1823 he jumped ship at Refugio Bay to begin a new life in California. Hill fell in love with a girl named Rafaela Ortega. At the time, Santa Barbara was under Mexican rule. In order to marry his love, Hill had to be become a Catholic and a naturalized Mexican citizen. He complied with the rules and married Rafaela. In what year was this adobe built? Who was Rafaela Ortega's grandfather? The Santa Barbara Courthouse is one of the more beautiful buildings in the city. It was built between 1926 and 1929, at a cost of $1,500,000. Take the elevator to the top of the Courhouse tower and view the city. List three things of interest you saw at the Courthouse. Missions were the religious part of Spanish colonization. The Santa Barbara Mission is one of 21 missions built along the west coast. It was founded on December 4, 1786, and restored in 1927. What destroyed the Mission, and in what year, which led to its need for restoration? Examine the washing basin which is located next to the fountain. It sered as the original Mission laundry. The Indians soaped clothes on the sloping side of the basin and rinsed them in the center of the pool. In what year was the washing basin completed? It was erected in memory of whom? Visit the Mission Gift Shop. California was controlled by Mexico until what year? Who discovered the Santa Barbara Channel, and in what year? 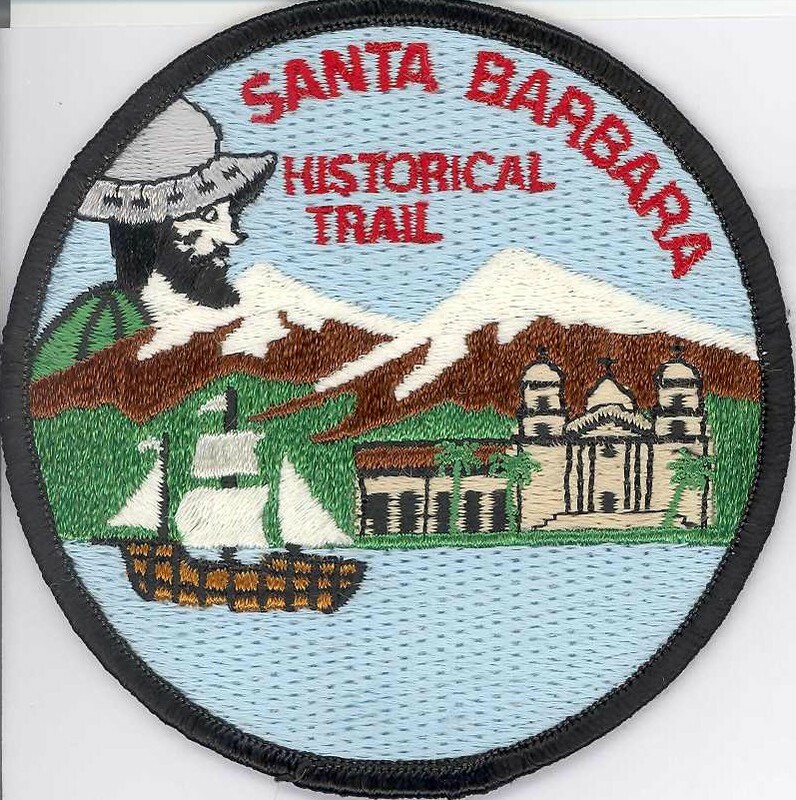 After you have completed this historical trail, you may purchase a Santa Barbara Historical Trails patch from the Los Padres Council, BSA, 4000 Modoc Road, Santa Barbara, CA 93110. Phone number: (805) 967-0105. The original concept of this trail was developed by Glen Soga and Dana Longo of Troop 26 in Santa Barbara as a Boy Scout Eagle Project. It was last revised in September 1998. For answers to questions, click here. Remember, this page is to check your answer.